What is a “Start Up” Consulting? As the name implies, Start Up consulting services are available for companies who are seeking to establish a B to B, outbound tele-sales department or program. The ultimate goal of the Start Up is to provide you with a customized, fully documented ‘blueprint’, game plan, or ‘road map’ that you can use to establish and implement your program. 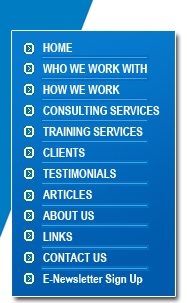 What will this consulting do for me? • Secondly, the Start Up will give you peace of mind. Yes, I know you’ve heard that benefit (peace of mind) used many times in many places. But it is particularly true in tele-sales. We help you avoid the typical “land mines” that can distort and dilute the effectiveness of your program; things like integrating tele-sales and field sales; thing like hiring the right staff for the right compensation rate. How does a Start Up Work? The ‘methodology’ of a start up is relative simple and works on the sample principal as the ‘audit and review’ for existing tele-sales programs. It starts with interviews with you and key players on your team; those who will be impacted by or those who will impact the tele-sales program. 1. Strategic Evaluation - the start up begins with a thorough assessment of the vision of your tele-sales program: what you want to accomplish, what you want to sell (product/service strategy), your target market, your pricing strategy etc. It is vital that your strategy is clearly defined and documented. 2. Human Resource Review- based on the information gathered in the strategic review we’ll look at the human resource component: the type of rep you need, the numbers required, supervision and management if necessary, the recruiting and selection strategies, core training, coaching, compensation, motivation and other issues that impact the sales reps and associated staff. 3. Call Management Process- this portion of the Start Up address the type of call that will based on the nature of the sale. Is your sale transactional or complex? Is your approach direct selling or sales support? What type of call cycle can we anticipate: one call, two, three more? What support is required? 4. Market Integration Review- telephone selling and marketing work best when coordinated and integrated with other forms of marketing. This portion of the Start Up looks at the marketing and sales support required (and if required) including web site support, e-mail marketing strategies, fax, direct mail, field sales support, technical support etc. 5. Key Indicator Evaluation- in this portion of the Start Up we will develop the key indicators that are necessary to evaluate the effectiveness of the sales effort. These include measurement of productivity, performance and profitability. 6. Telephony Assessment- while Teleconcepts is not a technology vendor it is capable of providing a superb overview of the type of telephony required to ensure the success of the tele-sales program. How do I get more information on the Start Up?